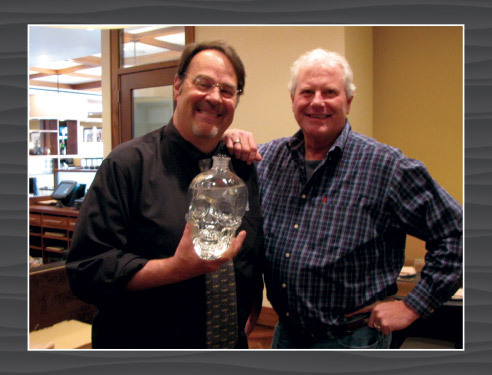 I met with Dan Aykroyd, a principal owner of Crystal Head Vodka, at the W in downtown Atlanta to do a live, recorded interview. Dan was accompanied by his partner, David Brown, and the president of their U.S. division, Bill Anderson, along with their national supplier, Craig Bernard of Infinium Spirits. 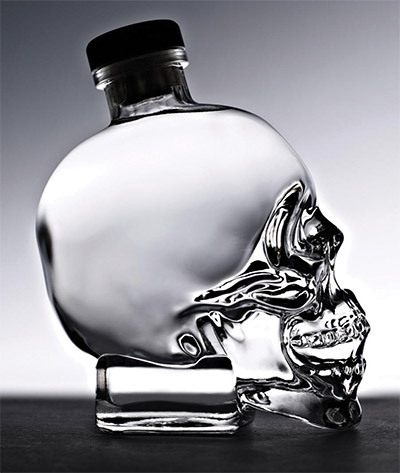 First we sat down to lunch with Celeste Dinos and members of the IMI Agency team, to discuss the features and benefits of Crystal Head Vodka in their national account customer base. Dan is decidedly Canadian and has all the language quips you would expect, especially the “ya knows.” It didn’t take long to figure out he is a very intelligent guy. We spoke about many subjects at lunch and I was impressed with his general knowledge of history and world affairs. We covered current events, war, movies, cars, airplanes, spirits, wine and some funny personal stories. He’s highly entertaining, as you might expect, and a genuinely nice guy. He did a few functions in town during his stay, including a big tasting with the local Bartenders’ Guild, before driving up to New York to do the 40th anniversary of “Saturday Night Live.” And yes, I said “driving.” I guess he prefers to drive rather than fly, if it’s close enough. MR: Okay, I have about eight questions or so. DA: Whatever you need, whatever. MR: You use the highest quality “peaches and cream corn” for your base distillate, right? What exactly is “peaches and cream corn”? And is the corn the only grain you use to ferment the product? DA: We only use corn, and the peaches and cream corn is the corn that is grown for supermarket consumption in Ontario. It represents the original strain of corn that was planted in the Ontario prairie around St. Thomas, Ontario and Chatham, Ontario basically in the 1800s. It’s the same strain with no genetic modification, ‘cause it’s not necessary. The yields are great; they don’t need to do that. And so it is the corn you buy in the supermarket in the summer to eat at a barbeque, as opposed to the bulk cattle feed that’s grown in the same area. So there’s some fields that have the small-kernelled corn fed to cattle; then there’s the big fat, beautiful yellow kernels that they call the peaches and cream corn, that’s for human consumption. MR: Being from Michigan, I’d like to know if it is like Indian corn, with both yellow and white kernels? DA: Yeah, they are yellow and white, and much bigger than the cattle corn. MR: Okay, how about a little information as to how it’s distilled and how many times. I know everyone has their own idiosyncrasies about the number of times, and so on and so forth. Can you give us a little background on what’s going on there? DA: Well, because we have the beautiful peaches and cream corn and the beautiful water, we think that our flavor just going in gives us an advantage just because of the quality of our products, including the water and the corn. We want that taste profile to come through so we did various tests and we found that four distillations for Crystal Head achieved the taste profile we were comfortable with, and on the notes that have been given to us (by Anthony Dias Blue) are sweet, vanilla, dry, crisp with a kick of heat off the finish. So that’s what four distillations do for us. If we did two or three more, then you might start to cut out some of the sweetness – we don’t want to do that. If you did any less, then there might be a harshness there, so for us, four does it. There’s some that do seven and eight, some that do only one. The still is stainless steel and it’s operated by the government of the Province of Newfoundland Labrador Liquor Corporation in St. John’s, Newfoundland, and is a very clean, super-hygienic facility. And so the distillation process is not that different to other vodkas. But, ya know, it’s just the people that are doing it in the facility it is happening in, that I think steps our quality up to a higher level. MR: You say it is government controlled. Why is it government? To us here in the U.S., that’s odd. DA: Ontario and, in fact, every province in Canada used to have a still because the government regulates liquor sales and distribution. So in Ontario, they had their own whiskey still for many years but now it’s gone; and in Alberta, they had a still; but Newfoundland is the only one that kept theirs. It’s primarily because the government is involved right through – they’re involved in the manufacture of the product: They make rum, screech rum (a dark rum found in Newfoundland of Jamaican descent), they make Iceberg vodka and they make our vodka, and that goes into their government stores. It’s very regulated up there, which is good for us because, that again, is ensuring quality. So they kept their government still up there in Newfoundland, unlike any other provinces. It employs a lot of people – on our line alone, about 35 people. I think it just grows out of the tradition in Canada for government sales of spirits, and that’s all across the country. We rely on our beautiful peaches and cream corn, our beautiful aquifer water from Newfoundland, a four-time distillation process and then a seven-time filtration through carbon micron, and then the Herkimer diamonds as our last little finish. MR: The water is so important to your process. Can you tell our readers a little bit about it and why it is such a vital element? DA: Ya know, every high quality vodka, any high quality vodka has gotta have that water. So that’s why Reyka, for instance, from Iceland, has that beautiful Icelandic water. We have the Newfoundland glacial aquifer water, as everyone knows. Sixteen thousand years ago, there was 800 feet of ice above the planet (region) – the Wisconsinan glacier covered basically one-half of North America. It melted, and the water went into the province of Newfoundland, which is porous rock, full of lakes and creeks and rivers and ponds. So that water is sitting right there from the original time of the first melt, and it’s sitting in an aquifer right there under the whole province. The still is above one of the main aquifers and we just take it right up directly from the aquifer, right up into the still. DA: Yeah, and its got all these minerals from the original time, from the original melt and that’s what makes it so sweet and so attractive for our process, because we don’t burn up those minerals through over-distillation, we keep those minerals there. They were untouched by acid rain. A lot of the acid rain hit Vermont, New York and Ontario, Quebec; and ya know, you couldn’t catch a trout there in the ‘70s because of the acid rain. But Newfoundland never got the acid rain because the Erie plume of pollution was all blown by the jet stream under the province. It’s, ya know, a thousand miles from the mainland and it just has this beautiful legacy of pristine lakes, pure air and water. MR: That helps give your vodka flavor, right? You like your vodka having flavor. DA: Well, ya know, by law vodka is supposed to be tasteless, odorless and colorless. Well, Grey Goose changed all that with their tasting panel – oh, all of a sudden vodka has a taste! Okay, well, our taste is sweet, vanilla, dry and crisp with a kick of heat off the finish. So while defining sort of legal parameters there, yes, vodkas, even without flavoring, certainly have taste to them. And so we’re proud of our taste because we don’t use any additives at all. We rely on our beautiful peaches and cream corn, our beautiful aquifer water from Newfoundland, a four-time distillation process and then a seven-time filtration through carbon micron, and then the Herkimer diamonds as our last little finish. And we just basically trust our materials to come home on the taste. A lot of lesser-priced vodkas, you open them up and they smell like perfume. That’s because they added citrus oil and you can’t smell the alcohol because they’ve added glycol or glycerin – not enough to kill ya but enough to take out the alcohol with and then they add sugar. Now, if you’re a bartender and you know you have a product that doesn’t have these additives in it to make a cocktail with, you’re going to be going to that as a professional, and that’s what Crystal Head is: the virgin canvas for professional mixologists to build great cocktails. It’s also great as a cold shot – as we saw at lunch – and can be drunk alone, but I don’t know who drinks warm vodka. I don’t drink warm vodka! (laughing) I prefer it in a mixed drink or in a straight-up martini with a little olive juice and a little vermouth. 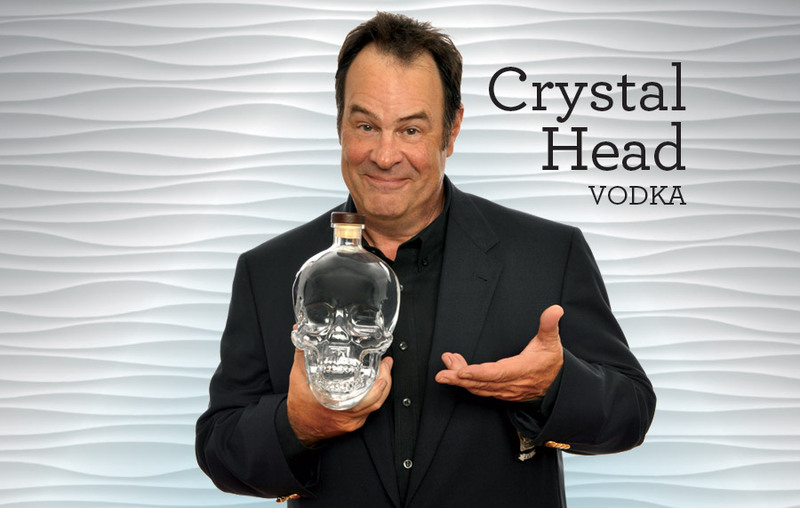 And so Crystal Head is really the professional mixologist’s friend. MR: Nice, nice. We have to talk about the legend of the skulls, don’t we? DA: Sure, sure. We were trying to figure out how do we sell the idea of purity, enlightened drinking, being a little more enlightened about what you’re putting inside your body and going towards the clean and the green. So the skulls were kind of the perfect vessel to use for this product. The Navajo, the Aztec, the Mayans all speak in their legends about having these skulls passed down to them, either through generations, or as the Navajo said, there were star children – that is, extra-terrestrials – that gave them these skulls. And ya know, crystals have a storage capability. We even have them in some parts of our brain. We have piezoelectric properties there – we have those crystals in some parts of our brain, near the amygdalae I believe, you’d have to go to an anatomist. But we’ve got crystals there in our brain, we have crystals in computers, we have crystals in phones, everything today has crystalline properties because crystals have a storage facility just built in, it’s called a piezoelectric property. So, the Navajo used them as crystal balls essentially. They get these skulls, then start to pray on them and all of a sudden the shaman would see images of the future, the past and the present of the tribe there, presenting themselves. And so we thought, what a perfect, ya know, kind of spiritual way to sell the vessel. DA: Crystal ball, positive energy, positive enlightenment, positive thinking, pure drinking; and so it just seemed to be, ya know, the perfect legend to serve our product in. And it’s fun to talk about, too, ya know, because there’s a bit of a mystery to it. Did they really come from extraterrestrials? Were they polished over thousands of years and handed down, or are they all fakes? MR: There are certain ones in possession of mankind, right? DA: There are three in museums and the rest are privately owned – yeah, eight of them. MR: Did you ever touch one? DA: I never have seen one. DA: No. The one, the Mitchell-Hedges skull – the one we patterned our skull on – lived in Ontario near my home for many years, but I never saw it. The woman, Anna Mitchell-Hedges, that owned it, her grandfather discovered it. She discovered it with him in Lubaantun, Belize in the late ‘20s and she used to show it to people. They would come in for healing sessions, and she would open the black cloth that it was under and there was an immediate feeling of well-being that came over everyone that saw it. One of the founders of our company, now deceased, Walter High, he saw the Mitchell-Hedges skull and he said it was just incredible, as he could feel something happen in his whole body, like a tingling sensation and a warmth – that kind of well-being. It is now in Indiana, owned by the gentleman that took care of Anna Mitchell-Hedges at the end of her life. He’s looking for the other five now. He wants to get all thirteen of them together. MR: I’d like to be with him on the journey. DA: Yeah, it would be tough. They were found all over the world. DA: Yeah, exactly right, exactly right. “Indiana Jones” references the Mitchell-Hedges skull in that movie. Yeah. MR: What would you like to convey to our food and beverage readers about why it is a good idea to carry Crystal Head vodka? Besides the purity of it and so on, how can it help their bar? DA: It’s just better, better than what is out there. I’ve always wanted to do something better or best. I’ve had a number one television show, number one radio show, number one record, number one movies, which I’ve done in collaboration with great people, so we’re collaborating with some great people on this project. We are doing something that’s just better. Just a little better than what’s there, a step up from the norm, that’s why we built it. To do something that is the best in its field. And we are winning medals all over the world. We won in Prodexpo in Moscow – out of 400 beverages, they said ours was excellent in taste; we won the ALIA, (Australian Liquor Industry Awards); and we’ve won the World’s Spirit Competition. So, we’ve got six gold medals and people are really responding to the cleaned-up taste. We are doing something that’s just better. Just a little better than what’s there, a step up from the norm, that’s why we built it. MR: As an actor, you just didn’t take to making a vodka because you can put your name on it – this is you. It’s not your first time at the rodeo for spirits, right? DA: I started by importing Patron into Canada, and started to look to the vodka category and began to find out, ya know, that glyceride and citrus oils and sugar were added. I thought, maybe we can do something better and clean it up a bit. It’s not so much me wanting another career, because I didn’t need that and I don’t need to work anymore, but it was more for my own personal taste. I just wanted something better to put into my own body and to share with my friends. the virgin canvas for professional mixologists to build great cocktails. MR: You’ve got a career with this thing – it’s taking off. DA: Yeah, it’s full-time for me. I mean, I have fun doing it. You know what’s fun is you’re selling something people want already. And people like. We’re in almost 50 countries, ya know, and people everywhere are starting to try it and get a sense that there is an alternative to lesser products, and we’re it. MR: Well, Dan, that’s about it.